Background: Mishriwala is one of five exclusive clusters of Kashmiri migrants established in 1990 to accommodate Kashmiri Pandit families who left Kashmir valley in the wake of militancy. Mishriwala migrant camp has seen minimal immigration and out-migration since its establishment. In an earlier study we reported on the prevalence of dementia amongst a Kashmiri migrant population. 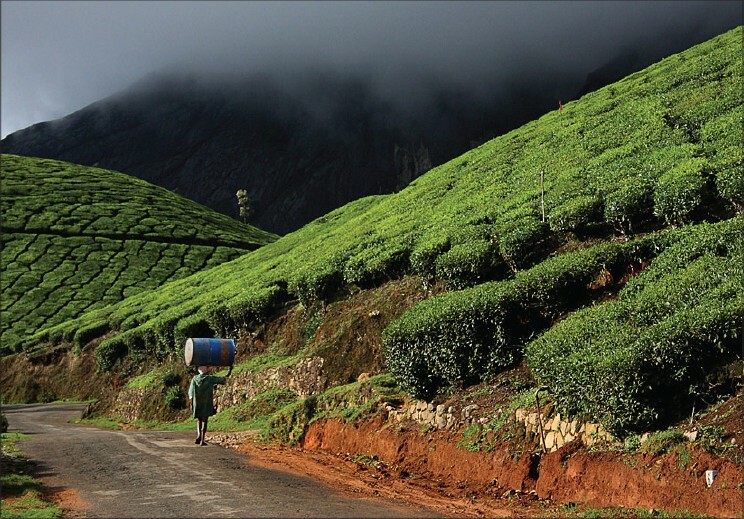 That study was conducted in the migrant camp at Mishriwala, 12 km west of Jammu city, the winter capital of Jammu and Kashmir State. We have developed standardized study methods and instruments for use in the Kashmiri-speaking population, which we used for screening for dementia during the prevalence study. We now report the results of a 1-year prospective study carried out to find out the incidence of dementia in the same population. Aim: To ascertain the incidence of dementiain the Kashmiri Pandit population aged 60 years and above. Materials and Methods: A 1-year, prospective, epidemiological study of 186 subjects aged 60 years and above, using cognitive and functional ability screening and clinical evaluation. Results: The incidence of dementia in this population was 5.34 cases per 1000 person-years. Objective: To determine the extent of hypoplasia of the component vessels of the circle of Willis (CW) and the anatomical variations in the anterior communicating artery (AcomA) in the subjects who have died of causes unrelated to the brain and compare with previous autopsy studies. Materials and Methods: The external diameter of all the arteries forming the CW in 225 normal Sri Lankan adult cadaver brains was measured using a calibrated grid to determine the occurrence of "typical" CWs, where all of the component vessels had a diameter of more than 1 mm. Variations in the AcomA were classified into 12 types based on Ozaki et al., 1977. Results: 193 (86%) showed "hypoplasia", of which 127 (56.4%) were with multiple anomalies. Posterior communicating artery (PcoA) was hypoplastic bilaterally in 93 (51%) and unilaterally in 49 (13%). Precommunicating segment of the posterior cerebral arteries (P1) was hypoplastic bilaterally in 3 (2%), unilaterally in 14 (4%), and AcomA was hypoplastic in 91 (25%). 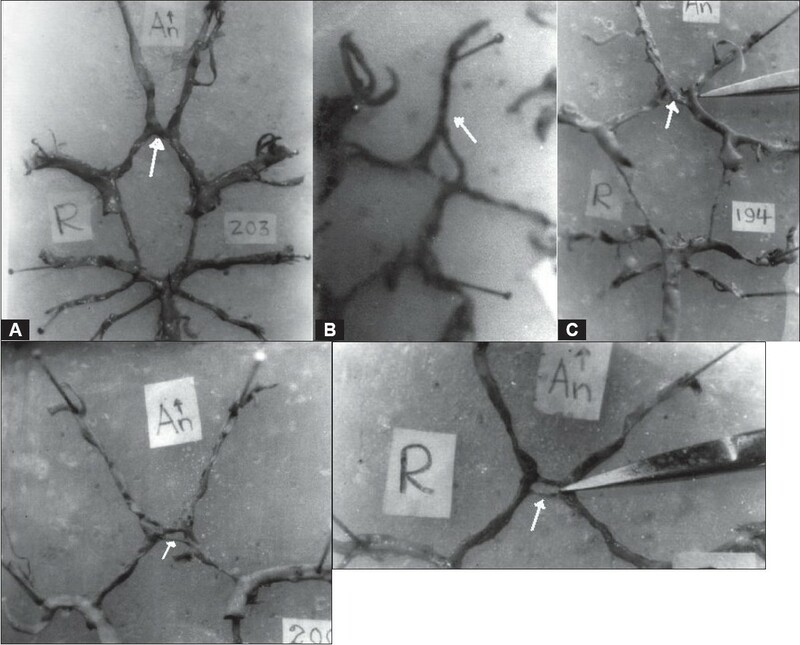 The precommunicating segment of the anterior cerebral arteries (A1) was hypoplastic unilaterally in 17 (5%). 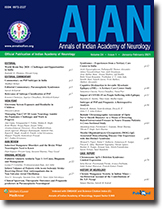 Types of variations in the AcomA were: single 145 (65%), fusion 52 (23%), double 22 (10%) [V shape, Y shape, H shape, N shape], triplication 1 (0.44%), presence of median anterior cerebral artery 5 (2%), and aneurysm 1 (0.44%). Conclusion: The occurrence of "typical" CW in autopsy brains was rare. Further studies would be necessary to determine if these anatomical variations could predispose to cerebral ischemia and premature stroke in the Sri Lankan population. Background: Glycoconjugate molecules expressed at the plasma membrane of mammalian cells have been reported to be associated with tumor progression. The measurement of total sialic acid (TSA) and lipid-bound sialic acid (LBSA) in the cerebrospinal fluid (CSF) is suggested to be useful for the diagnosis of brain tumors. 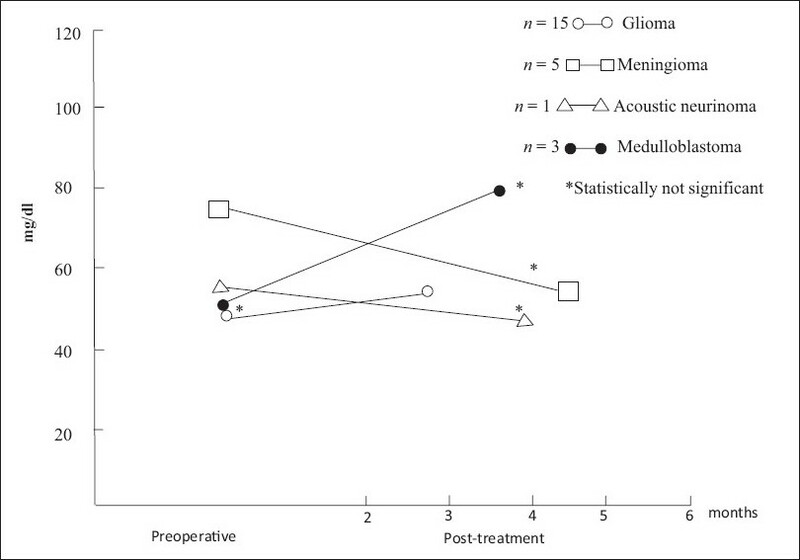 But there are very few reports available on the serum glycoconjugate levels in patients with brain tumors. Objective: The objective of this study is to check the feasibility of using serum glycoconjugates such as TSA and LBSA as tumor markers in brain tumor patients. Materials and Methods: Colorimetric estimation of TSA using diphenylamine was done on 100 patients with intracranial tumors; follow-up study was carried out in 24 cases. The LBSA fraction was isolated from the serum of 68 brain tumor patients and evaluated using phosphotungstic acid and resorcinol; follow-up study was done on 23 patients. The various types of brain tumors included in this study were glioma, meningioma, and acoustic neurinoma as well as some other types such as medulloblastoma, secondary tumors, and craniopharyngioma. Results: There was no significant difference between the TSA and LBSA concentrations seen in pretreatment or post-treatment cases and that seen in control subjects. Discussion: TSA and LBSA do not have the ability to discriminate between benign and malignant brain tumors. TSA and LBSA appear to be tumor markers of very limited value in patients with brain tumors. Background: The neurovascular conflict in trigeminal neuralgia is an intractable condition; medical treatment is usually of long duration and can be annoying for both patients and clinicians. 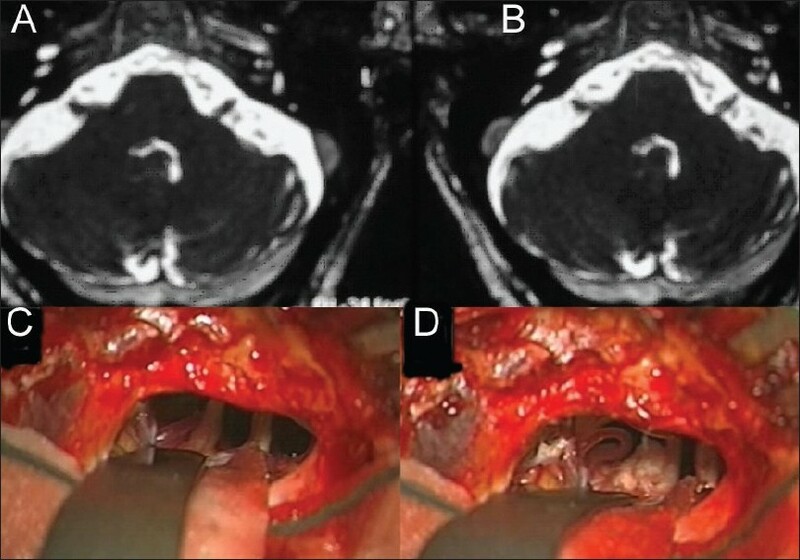 Aim: This prospective study was designed to assess the outcome of microvascular decompression (MVD) in patients with more than 3 years' history of intractable idiopathic trigeminal neuralgia (TN) and poor response to drugs. 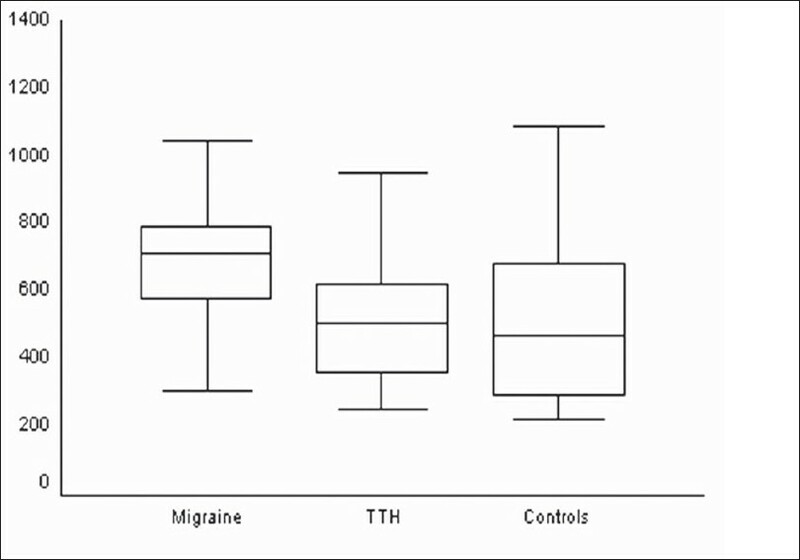 Materials and Methods: Twenty-one patients (8 females and 13 males) with intractable idiopathic TN (group 1) underwent MVD and were followed up for 2 years. Group 2 (n = 15), which included 6 females and 9 males, received pharmacotherapy. The outcome responses of pain relief were evaluated using a 10-cm visual analog scale (VAS) and the Barrow Neurological Institute (BNI) scoring system. The patients' morbidity was recorded as well.Results: All patients fulfilling the inclusion criteria were offered MVD surgery. Freedom from pain was achieved immediately after surgery in 95.2% (n = 20) of patients in group 1, and 90.5% (n = 19) had sustained relief over the follow-up period. There were no statistical significance recurrences or surgical complications in group 1 (P>0.5), while 53.3% (n = 8) of the subjects in group 2 showed poor response with pharmacotherapy over the same period of time and many patients experienced drug intolerance that had statistical significance (P<0.01). Conclusion: Early MVD in TN can help patients avoid the side effects of drugs and the adverse psychological effects of long-term pharmacotherapy and prolonged morbidity. 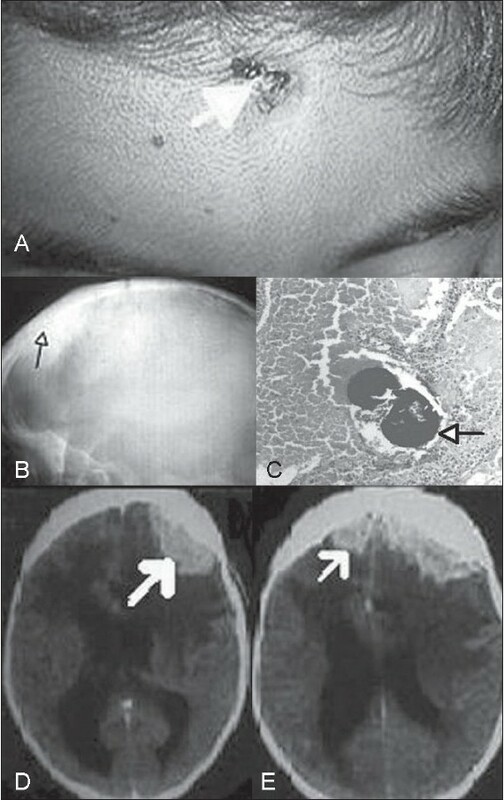 Spontaneous intracranial hypotension (SIH) is characterized by orthostatic headache (OH), low cerebrospinal fluid (CSF) pressure, and diffuse pachymeningeal gadolinium enhancement (DPME). We present here the case studies of two patients. One patient demonstrated a CSF leak in the mid-thoracic region, and recovered completely with conservative treatment. 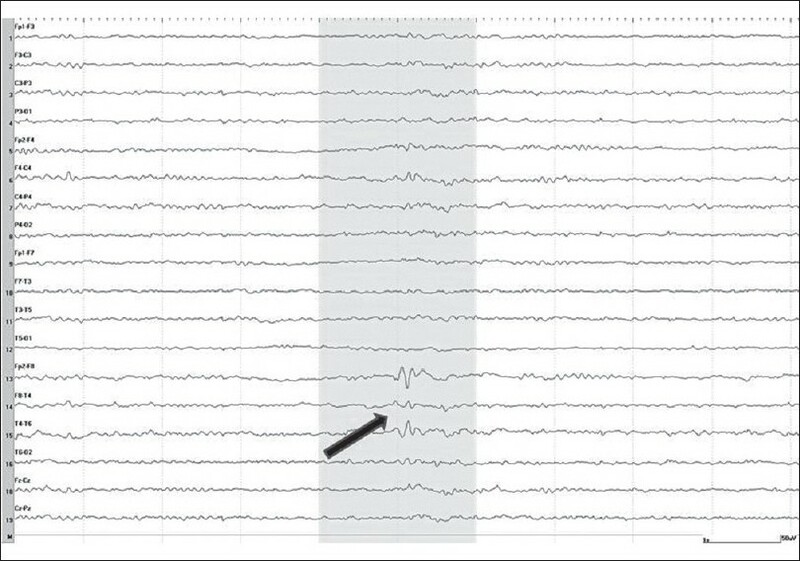 The other patient in whom leak could not be demonstrated, developed dementia, rapidly worsening encephalopathy, and became comatose, necessitating urgent epidural blood patch (EBP) with 25 cc of autologous blood, after which immediate and complete symptomatic relief was obtained. A second EBP was required a few days later and also provided complete and sustained clinical benefit, without subsequent recurrence. Both patients had OH and showed bilateral subdural fluid collections, DPME and "sagging" of brain on MRI. 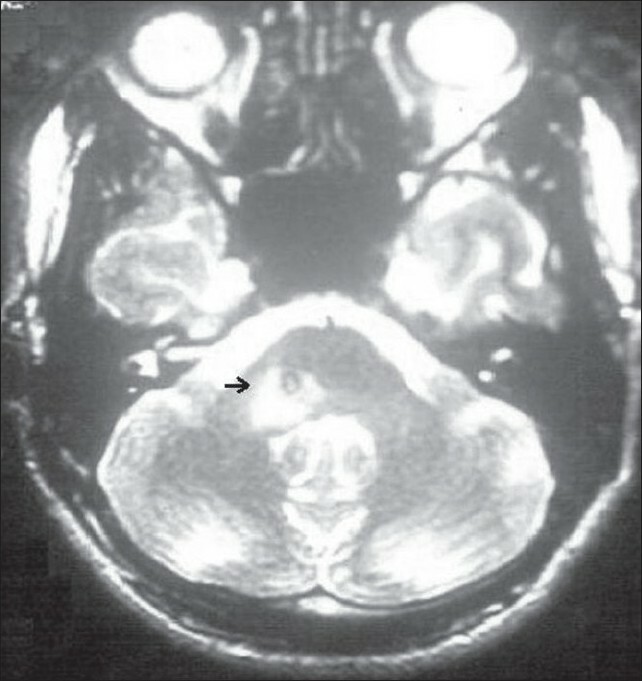 A high index of suspicion, recognizing the orthostatic nature of headache, and typical findings on contrast enhanced MRI should point to the diagnosis of SIH. EBP can be effective treatment in patients unresponsive to conservative measures. Stroke in young poses a major health problem. Thrombophilic factors have been implicated in 4-8% of the young strokes worldwide. Protein S deficiency is a rare cause of recurrent ischemic stroke in young population. Only a few sporadic cases have been described in the literature. 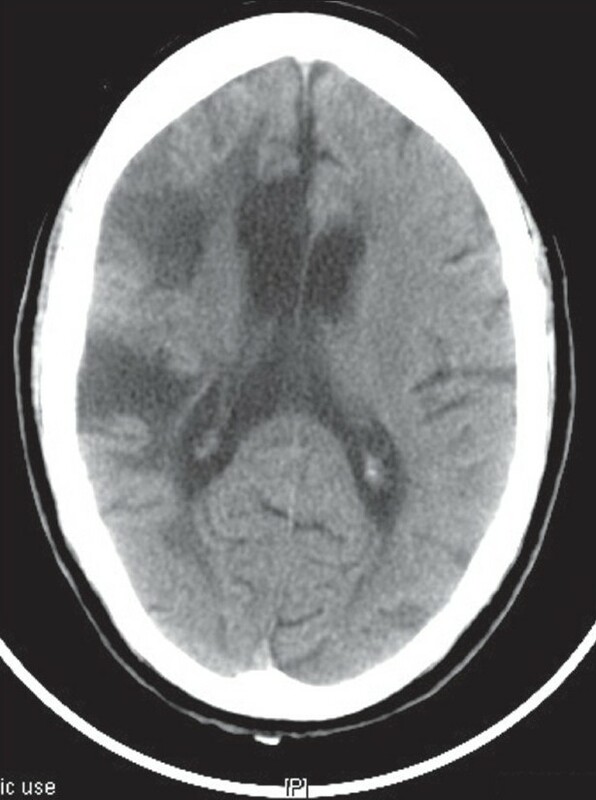 We are reporting a case of protein S deficiency-related recurrent ischemic stroke in a 16-year-old girl. Early diagnosis and targeted approach can help such patients to prevent recurrent thrombotic episodes. A mobile plaque in the carotid artery is an uncommon entity, usually detected incidentally on a carotid duplex scan or angiography. It is associated with an indeterminate risk of an embolic stroke and should be managed on an emergent basis. We report here a case of a mobile plaque in the internal carotid artery that was detected serendipitously in a carotid duplex scan. 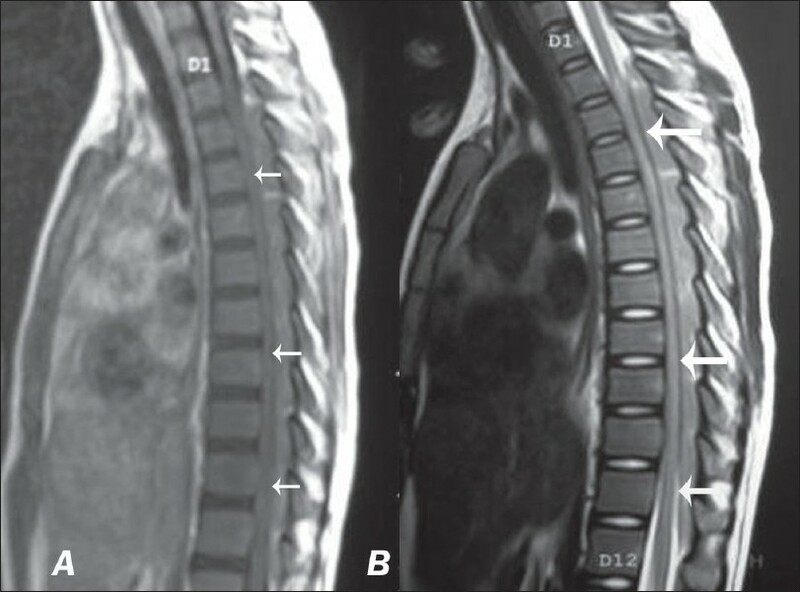 Paraplegia due to a spinal cord epidural mass is an extremely rare presentation of undiagnosed leukemia. We are reporting a case of 14-year-old girl, who presented with paraplegia due to thoracic epidural mass, as the initial presenting manifestation of acute myeloid leukemia. Granulocytic sarcoma or chloroma should be considered in the differential diagnosis of an epidural mass in patients with or with out leukemia granulocytic sarcoma, which are rare extramedullary tumor-like proliferation of myelogenous precursor cells that may de novo precede acute leukemia or coincide with the first manifestation or relapse of acute myeloid leukemia. The apnea test is a mandatory examination for determining brain death (BD), because it provides an essential sign of definitive loss of brainstem function. However, several authors have expressed their concern about the safety of this procedure as there are potential complications such as severe hypotension, pneumothorax, excessive hypercarbia, hypoxia, acidosis, and cardiac arrhythmia or asystole. These complications may constrain the examiner to abort the test, thereby compromising BD diagnosis. Nevertheless, when an appropriate oxygen-diffusion procedure is used, this technique is safe. We review here the prerequisites to begin the test, its procedure, potential complications, and the use of alternative ancillary tests. We recommend that the apnea test be retained as a mandatory procedure for the diagnosis of BD. In those situations when the apnea test is terminated by the examiner for some reason or when it is impossible to carry it out in a patient due to the presence of some pathologic condition, alternative ancillary tests should be used to confirm BD.